A great value introduction to the key sites, cities and wildlife of South Africa on this Cape Winelands and Big Five Escorted Tour. This tour is a fantastic opportunity to discover the joy and excitement of travelling on the African continent. Take in the key attractions of South Africa, from the pristine beaches of False Bay and a city tour of Cape Town to an exploration of the winelands of Franschhoek and game drives in Pilanesberg National Park. This 8-night Africa ‘taster’ is sure to whet your appetite for the continent which is why we are also offering both pre and post-stays around your holiday. Arrive in Cape Town and continue to Simons Town on the Cape Peninsula, where you will spend the first three nights of your tour at the locally rated 4-star Quayside Hotel. The Quayside is a boutique hotel with a scenic harbourside setting, close to the famous penguins of Boulder’s Beach. It offers a quieter, more relaxed base from which to explore Cape Town, a 40-minute drive away. False Bay is a renowned centre for whale watching in South Africa and if you are lucky you might see whales from shore. It is also a key breeding ground for the South African great white shark with many operators offering tours to see them. If you prefer a cuter animal experience then Boulders Beach with its African penguin colony is within walking distance of the hotel. Later, visit Hout Bay for a lunch of locally caught fresh fish, navigating Chapman’s Peak Drive, one of the most spectacular marine drives in the world. An afternoon boat ride to Seal Island brings you face to face with some of the larger aquatic life of the region, with possible sightings of Bryde whales, humpbacks, dolphins and orcas, while the island’s population of Cape Fur seals attracts large great white sharks. Return to the hotel for a well-deserved rest and dinner. Look forward to a day at leisure to explore Simon’s Town and its surrounds. Simon’s Town has been an important naval port since its foundation in 1680 and you can discover its history at the Naval and Submarine Museums. Alternatively, see miniature armies and other toys at the Warrior Toy Museum or have your picture taken with the statue of ‘Just Nuisance’, the only canine member of the Royal Navy who lived and died here during World War ll. 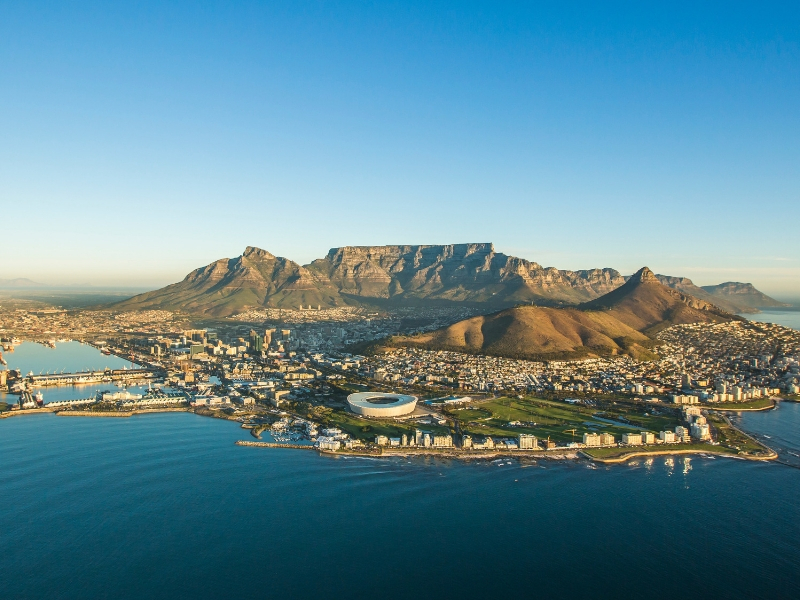 After breakfast, drive to Cape Town and enjoy a tour of the city, including a cable car ride (weather permitting) to the top of Table Mountain for a bird’s-eye view and stunning vistas over the bay to Robben Island and Apostle mountain. Cape Town’s appeal comes from the way nature is woven through the fabric of the city. The precipitous slopes of Table Mountain, cloaked in delicate vegetation, are omnipresent, while the white sands and crashing waves of the city beaches and the many gardens first planted by the Dutch colonists add a soothing element to the chaos of the city. After your tour, enjoy some free time to explore the waterfront independently before continuing to Somerset West, in the heart of the winelands, where you’ll spend two nights at the locally rated 4-star NH The Lord Charles. Your hotel is perfectly placed for exploring the Cape Winelands, positioned as it is between the Helderberg Mountains and the Atlantic Ocean, in nine acres of manicured gardens. It was here that the original French Huguenots settled and introduced the skills of wine-growing and production to South Africa. Discover the local wine farms at your own pace aboard the Green Line hop-on-hop-off tram. On your journey you’ll be treated to incredible views of Franschhoek’s mountains as you visit the estates of Rickety Bridge, Grande Provence, Mont Rochelle, Le Lude, La Bri, La Bourgogne, Holden Manz and La Couronne. Return to your hotel for dinner and perhaps enjoy an evening stroll through the grounds. After breakfast, fly to Johannesburg and transfer to the locally rated 5-star Ivory Tree Lodge in the Pilanesberg National Park for a two-night stay. Set out on the first of four thrilling game drives through the park, in search of the ‘Big Five’. The park is one of the largest in South Africa, covering 55,000 hectares of an extinct volcano crater which is of great geological and anthropological importance – evidence of Stone and Iron Age occupation are found throughout the site. The park spans a transitional zone between the dry Kalahari and wetter Lowveld and so supports a population of animals and vegetation that includes elephant, lion, leopard and rhino, as well as abundant bird life. After breakfast, embark on a day in the bush, including two game drives and a bush experience. You’ll travel through the park in an open, 4×4 safari vehicle and experience encounters with some of the park’s 7,000 animals. You might even be lucky enough to catch sight of some of the park’s more rare species such as wild dog or cheetah.